I only got 41.3kg of winged yam this year. What went wrong? In drought, my food garden depends on recycled water. On an average day my waste water system supplies 250 litres for hand watering. That’s less than 1 litre per square metre per day. 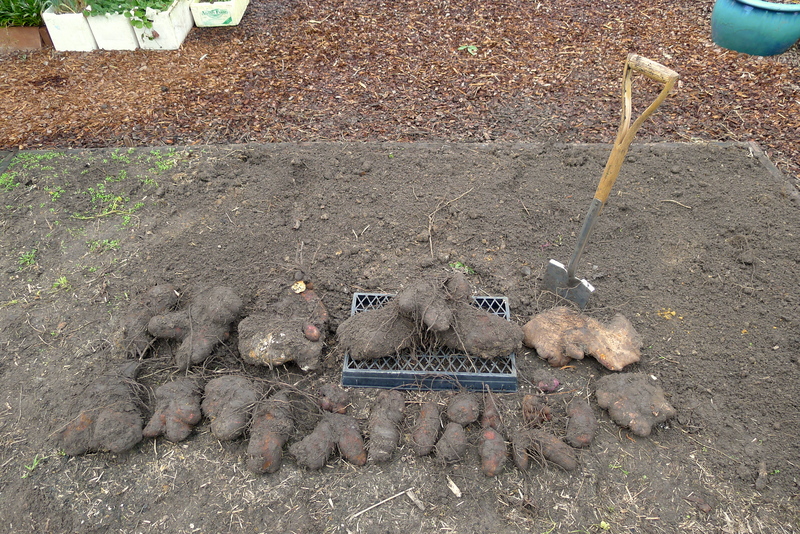 Yams are flood and drought tolerant, so you always get a crop, however yield is reduced by drought. Last year was the driest gardening year of my life. Between July and December 2012, my garden had one soaking shower of rain. When 63mm fell on 18th November it hit hot, parched soil and barely moistened the surface. Despite cloudless skies and hot, windy weather, I could only give my yams one weekly ration of waste water. So today I was disappointed to lift just 41.3kg of winged yam (Dioscorea alata) from a row 6m long by 60cm wide: that’s 17.2kg of yam per square metre instead of 20 – 30 kg per sq m.
This low yield is still generous when compared to potato. Many subtropical gardeners struggle to produce a decent crop of spuds. Our warm soils and damp, humid coastal conditions help aggressive fungal diseases ruin these cool temperate crops. My average crop of potatoes is 35kg per 10 sq metres, or 3.5kg per sq metre. It’s a very light return. And then I have to find room in a fridge and keep them in the dark so they remain edible. So even my worst yam harvest has yielded 13.7 kg more per sq metre than potato. They’re washed clean of soil and sitting in boxes under my house where they will remain fresh and edible for at least another three months. If you want to try yams, local community gardens and local Seed Saver Networks (LSN’s) may offer them to members, and occasionally they are sold by Asian fruit shops. I share my surplus during my Open Days. Thrifty yams: adaptable, space and energy saving, productive and easy to store. They taste and cook like potato, but the starch is far more sustaining. In a warming world, where rainfall is increasingly unreliable, grow yams for family food security. Jerry, I would like to grow Coco Yams but where do I get some to start off? Green Harvest sell Greater or Winged Yams, and I grow these, I also grow Taro, but this is obviously different from Coco Yam. I sell my surplus at my open days as a visitor ‘perk’; my last open day was May, the next is August 2014. Jerry, something always puzzles me about your water saving strategies. I’ve had this question about previous posts where you culled and pruned plants during water restrictions. Question is: what then do you eat? If you only use recycled water but grow less food during times of drought (as with the yams) do you not then rely on store-bought food that has a higher ratio of inputs anyway? In my rented garden I rely on mains water, but my understanding is that the food I grow at home is more water efficient than food I would otherwise have to buy, and therefore watering my garden makes more sense than scaling back my food production in times of drought. Have I got it wrong? I’ve written about this at length in The Organic Gardener magazine. So what if I remove an annual to secure a fruit tree? I have perennials, just look at the range in my monthly ‘In Production Today’ blogs.